It was a big day yesterday for all Muslims over the world, as July 7 marked Eid-ul-Fitr which was the end of the month of fasting. So how can King Khan- Shah Rukh Khan be left behind in this celebration. 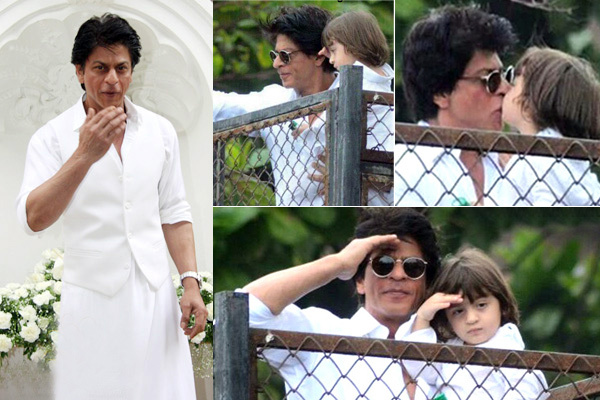 Shah Rukh Khan and his three-year-old son AbRam greeted fans and waved to media on Eid. Currently, Shah Rukh Khan’s youngest son AbRam is the cutest B-Town kid and one popular star kid. He is the youngest star kid who has a huge fan following across the globe. Eid became a little grander when Shah Rukh Khan along with son AbRam came out to greet their fans outside Mannat. Both father and son were seen dressed in white and in similar attire. AbRam made the cutest gesture by copying dad Shah Rukh Khan from saluting the crowd to waving at fans. Later on, 'Dilwale' actor SRK addressed the media and answered questions on the occasion and his plans for the special day.